Welcome to my campfire where stories and adventures are shared. You’ll find information about my published works, bits and pieces of writings just coming over the horizon, and hints of others that are down the trail a bit. Over time, you’ll discover my works cover a wide range from children to adult, light hearted to drama, and from close relationships to tragedy and crime. The writings coming down my trail cover struggles and conflicts of pioneers, families, widows, children, Indian Territory Oklahoma, Native Americans, No Man’s Land Territory, Dust Bowl days, post World War II injustice, and freedom. Historical events are sprinkled in along the way. When you leave, I hope it’s only temporary and your thoughts of returning are like you had with your first kiss. Heart pounding and nervous apprehension going in, but delirious excitement and out-of-breath anticipation to the next kiss (visit). "Welcome. 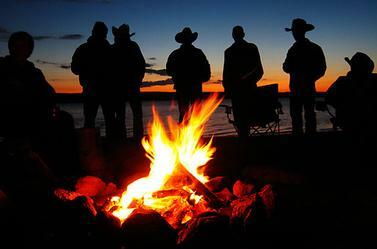 Come sit a spell,” the cowboy added as he motioned, “help yourself,” to what grub and coffee are left. “Rest a spell.” They soon began to spin stories about their adventures--bronc riding, cattle drives and stampedes, fair ladies kissed, mountains climbed, raging rivers swum, ornery critters whupped, deserts crossed, and damsels and children saved. Their imaginations flew to heights where only eagles soar. Time passed quickly, and the stranger climbed into his saddle, tipped the hat “Adios,” and galloped away.